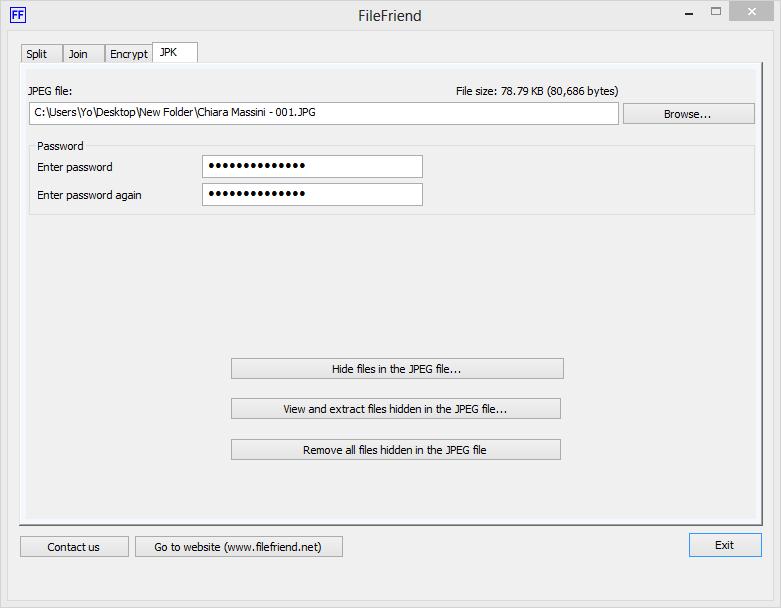 FileFriend is a file manipulation program which offers four modules- file splitter (Split), file joiner (Join), file and directory encryption tool (Encrypt) and steganography tool (JPK), which can hide files inside images (JPEG). 1. Split a large file into smaller subfiles, or join subfiles to reconstruct the original file. 2. Encrypt or decrypt files and directories. 3. Hide files in a JPEG file, or extract files hidden in a JPEG file. 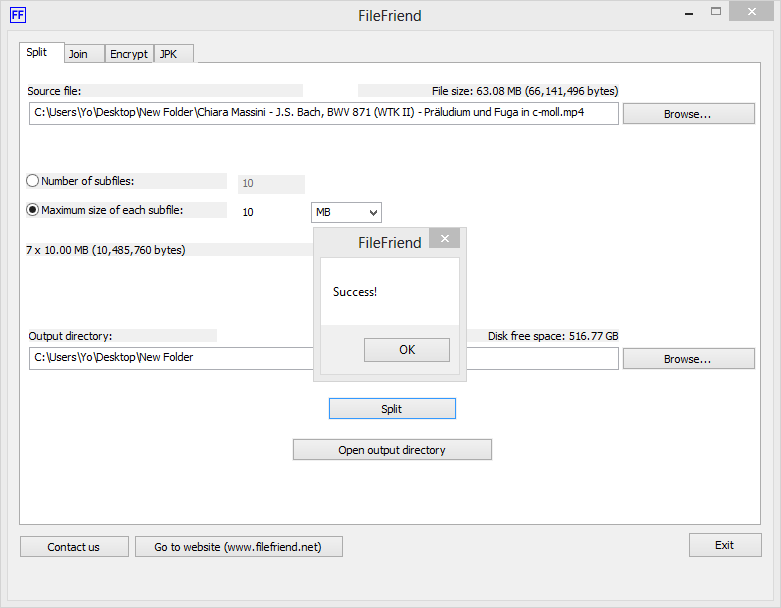 FileFriend is portable and stealth- it doesn't seem to save any settings- download the ZIP archive (FileFriend.zip), extract to a folder of your choice and run the executable file (FileFriend.exe). 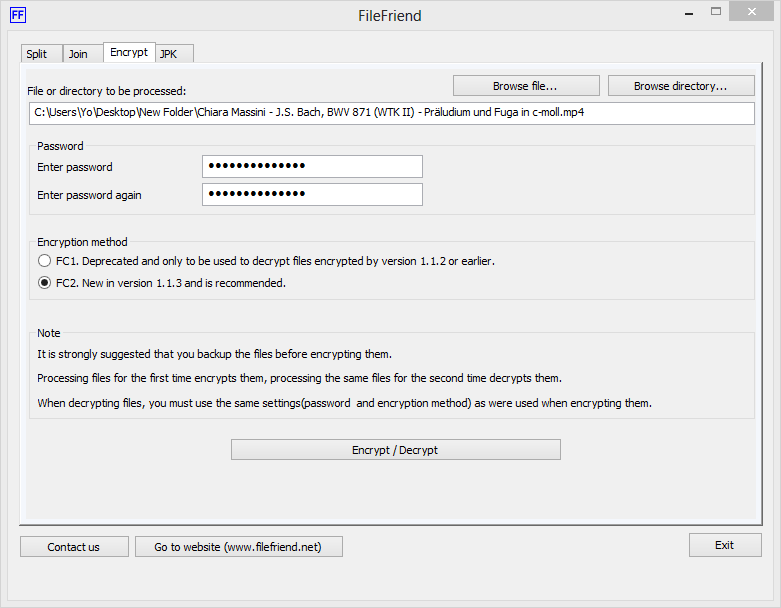 FileFriend is freeware but the license is not specified. - Both the splitter and joiner are lightning fast. - Encryption doesn't append any extension to the encrypted file- when encrypted the file simply cannot be opened. - When a whole directory is encrypted after the encryption the directory is accessible but the files inside it cannot be opened. - Two encryption methods are provided- FC1 and FC2- FC1 is deprecated and should only be used to decrypt files encrypted with FileFriend versions 1.1.2 or earlier, while FC2 has been introduced in version 1.1.3 and is the recommended one. - The steganography tool can be useful for sending of executable files as attachments via web-mail services which don't allow sending of EXE files. - Be careful with the encryption and the steganography tool, losing the password means that the encrypted and hidden files are virtually lost. Very interesting. I’ll try to check that out sometime soon. smaragdus wrote: FileFriend is freeware but the license is not specified. Improved progress dialog showing long file path names. does not contain any information about the advertisements that have been added. The worst about the advertisement FileFriend version 1.1.6.0 shows is that it is a direct download link. I have already expressed my disgust to the developer. 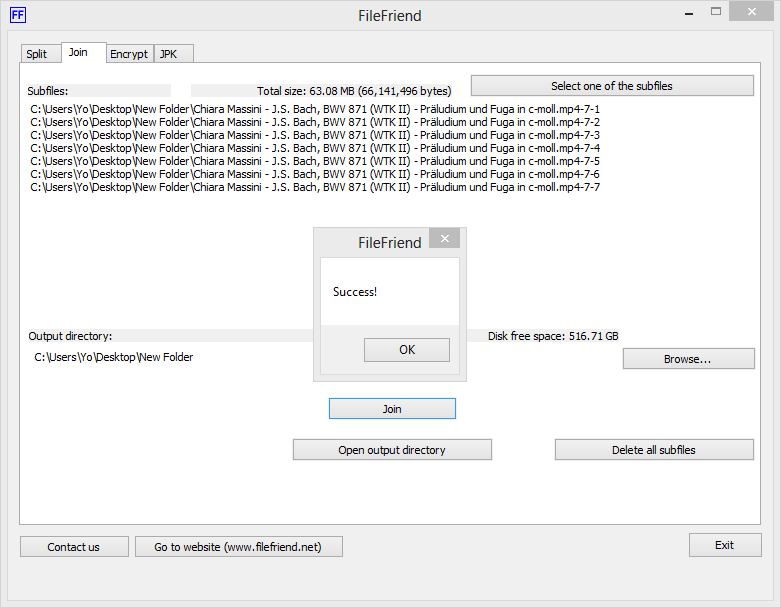 I have the last clean version of FileFriend - 1.1.5.0, if someone needs it I can upload it. The developer of FileFriend responded to my complaint about the banner with a very friendly message that he just wanted to let people know about another tool he had developed (DoggyFtp). He also removed the banner from FileFriend so version 1.1.6.0 is now clean of any kind of advertisement. If he permits me I would also like to quote a line from his reply. The link "Download newer version" was replaced with "A new version is available. Go to the website and have a look." Clicking the link opens the webpage for this program instead of starts a download directly. Softpedia listed this version as freeware, not adware. may find it useful and like it just as I do. 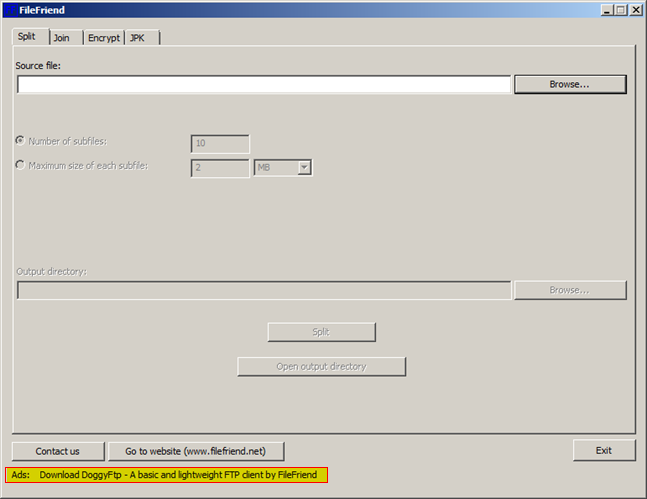 In the course of working on FF, I found the FTP client I was using not working sometimes, so I developed DoggyFtp and I have since used only DF for my FTP tasks. I also hoped people get to know DF and find it useful, so I let FF show a message telling people DF is now available. I was a little bit depressed by your words, but I love programming, I'll keep working on new programs and share them with people.I believe they render my value to this great world. Thank you for complaining, you let me know what people like and dislike. I turned off the message about DF on FF, hope this can make you guys happy. I guarantee that future versions of FF will not have an ads banner. 1. Remove the bottom region previously reserved for ads,thus making the dialog a little smaller.I had not thought much about ads banner being annoying before you complained about it.Now I realize that it IS annoying. 2. "Download newer version", which starts a direct download after being clicked, will be replaced with "Newer version is available", which opens the website only after being click. As it was mentioned that direct download is not so welcome.